A UN police officer and a local policeman have been killed in Kosovo, local police and the UN say. Reports suggest the international police officer was Ghanaian. The two were shot dead in their UN vehicle in the village of Luzane, north of the capital, Pristina, police chief Sheremet Ahmetli said. Kosovo - the UN-administered province in Serbia - last week saw some of the worst ethnic clashes in more than four years, in which 28 people died. The incident comes on the fifth anniversary of the Nato air strikes. Hundreds of others from both Serbian and ethnic Albanian communities were injured in last week's clashes after the violence started in the divided town of Mitrovica. As the clashes spread across the province, more than 3,000 Serbs fled their homes and churches attacked by ethnic Albanian mobs. Nato rushed in 2,000 more troops to help quell the violence.According to a UN police spokesman, the ambush took place after dark on Tuesday evening. 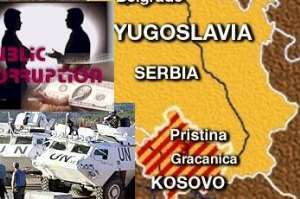 A clearly marked UN patrol car with three officers and an interpreter was travelling south towards Pristina from the town of Podujevo. It came under fire in a rural area from at least one gunman and crashed into the hillside, killing the two police officers. An investigation into the incident is now under way with the help of British K-For soldiers. UN police spokesman Derek Chappell, speaking from the scene of the crime, told the BBC these kind of attacks were quite rare in Kosovo. The only previous attack of this kind took place in August last year when an Indian police officer was shot dead, says the BBC's Tamsin Smith in Pristina.Earlier on Tuesday, Serbian Prime Minister Vojislav Kostunica once again defended his case for Kosovo's division along ethnic lines. After talks with top European Union officials in Brussels, Mr Kostunica said establishing separate regions for Albanians and Serbs was the only way to prevent further violence in Kosovo. Kosovo's unresolved status is the subject of a bitter dispute between its independence-seeking majority Albanians and minority Serbs who strongly oppose it.